At the Phoenix Annual Meeting, election results for District positions were announced and the winners were Karen Aspelin, President; Carlos Ortiz, Vice President; and Cathy Leong, Secretary-Treasurer. They each will serve a one-year term through the next Annual Meeting in Rapid City. 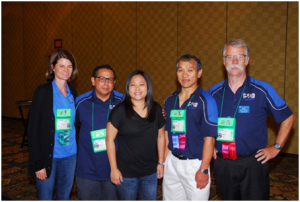 Jennifer Rosales was elected to serve a three-year term as International Director, which will begin in 2014. Jennifer served in the District officer positions from 2005 to 2009, and has recently returned to the West Coast after working for several years in the DC area.